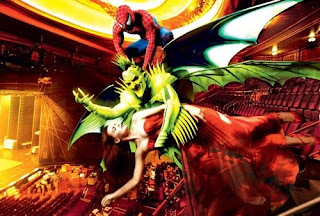 After taking a three-week hiatus for significant retooling, Spider-Man: Turn Off the Dark resumes previews this week, with producers promising that the troubled $70 million Broadway musical will now stick closer to the character’s comic book roots following the departure of previous director Julie Taymor, The New York Times reports. Says Taymor’s replacement, Philip William McKinley, the show’s lighter tone aims to appease the “8-to-88-year-old market,” with an additional $5 million going toward five new flying sequences, new and rewritten songs by Bono and The Edge and expanded roles for Aunt May, Uncle Ben and Mary Jane Watson. That sounds all well and good—especially that last bit about humility in light of the show’s disastrous history—but this shiny and new iteration of Turn Off the Dark evidently features a musical number in which the Green Goblin makes fun of voicemail. No, I don’t think it’s fixed yet.